When you hear the word ozone, the first thing that many people think of is air pollution. However, ozone protects us from harmful sunlight that causes skin cancers. In fact, many important uses of this powerful, naturally-occurring gas are not so well known, but they serve us every day. Major cities throughout the United States and the rest of the world use ozone to sterilize their public water systems, and ozone is often used to sterilize the fruits and vegetables we eat and the bottled water and sodas we drink. Ozone is used in air purification systems, commercial laundries, swimming pools and spa baths. Dr. Joseph Goodman is one of the few dentists in the U.S. using Ozone for dental treatments. Although approved and in use in Europe for many years, ozone dentistry was introduced to the U.S. market only a few years ago. The medical community — especially in Europe — has been using ozone for decades to speed up wound-healing and to treat a variety of diseases. Most of the original research was carried out in the U.S. and Europe in the early 1900s. Controlled ozone application has been found to be extremely safe and free from side effects — far less than most medications, including antibiotics. What could be more natural since our own bodies produce ozone at the white-cell level to kill offending microorganisms? The ozone molecule is the most powerful agent that we can use on microorganisms. It is deadly to bacteria, viruses, and fungi, yet the more highly evolved human cells are not damaged by ozone in lower concentrations. Ozone’s pioneering use in dentistry naturally followed. 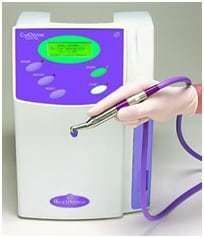 The KaVo Company has manufactured a dental ozone delivery unit called the HealOzone, and it is being used by dentists all over the world. Millions of patients have already been treated with the HealOzone worldwide, and not a single adverse side effect has ever been recorded. Estimates are that there are over 100 HealOzone units currently in use in the U.S. Originally, the HealOzone unit was about to receive approval as a medical device, but then the FDA decided to treat ozone as a new drug and started the slow approval process all over again. This has stymied sales of the units in the U.S. There is a common misconception among dentists that using ozone in their practices is illegal. Ozone has been grandfathered into usage in the medical and dental world because it was in use before the 1906 Pure Food and Drug Act. There also have been rulings specifically permitting ozone use, most notoriously with the Dr. Atkins case. We can select many materials for use in our dental practices that have not had FDA approval, such as hypochlorite for endodontics. Therefore, FDA approval is not necessary and it is completely legal for dentists to use ozone. Ozone Custom Trays are used for total saturation (microbaric therapy) of all periodontal tissues AND carious lesions, precarious areas, occlusal grooves, interproximal areas and margins of existing restorations. This can prevent caries and aid in recalcification of areas that have minimally invasive caries.